On its continuous effort to strengthen its ties among its neighboring countries, Thailand through Thailand Convention & Exhibition Bureau (TCEB) recently shared to Philippine media its bilateral MICE collaboration and trade promotion between Thailand and the Philippines with innovative business solutions and strategic collaboration with the Philippine Chamber of Commerce and Industry (PCCI) and Chamber of Commerce of the Philippine Islands (CCPI). In a press conference held at Dusit Thani Hotel in Makati City, TCEB President Nopparat Maythaveekulchai mentioned that in line with 2015’s ASEAN integration, TCEB has developed an initiative dubbed ASEAN MICE which is set to strategically connect Thailand with regional alliances in the Philippines. 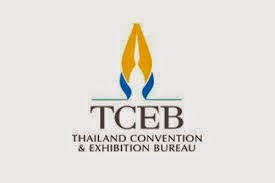 TCEB aims to achieve long-term competitiveness and sustainability for the service sectors of Thailand together with partner- markets especially for the exhibition industry. In line with this TCEB also actively collaborates with other counterparts and government agencies under ‘Thai Team’ including the Ministry of Foreign Affairs, Ministry of Commerce and Department of International Trade Promotion in moving Thailand’s MICE industry forward. Following the official bilateral collaboration between TCEB and the PCCI and CCPI last year, Thailand proudly shares that they welcomed 54 percent more visitors to their trade shows as compared with their 2012 figures. 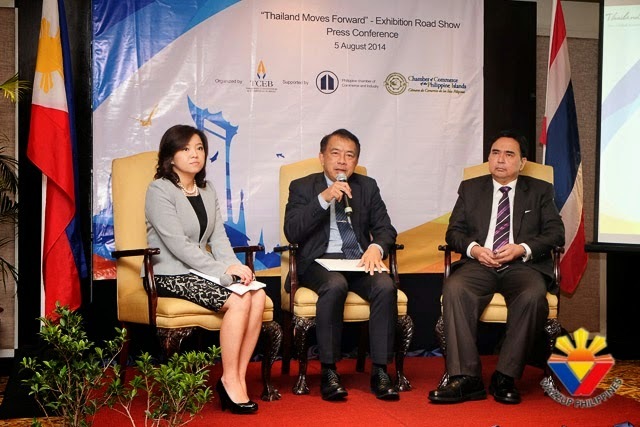 So, in line with he development and to further attract visitors and investors, TCEB mounted "Thailand Moves Forward" exhibition road show, a vital activity in fostering camaraderie among agents and promote Thailand’s Connect Businesses Campaign among Filipino entrepreneurs. Thailand's popular services and products that have been attracting the world's market are beauty and wellness, machinery and auto part, culture and tourism, jewelry and education, and even print and packaging. This year, participating the trade show are its organizers IMPACT Exhibitions Services, Reed Tradex and Philippines MICE travel agents. TCEB is now working closely with key public and private sector partners to promote and reinvigorate the country’s positive image, reinforcing stakeholders’ understanding of Thailand’s key MICE industry strengths: diverse destinations right at the heart of the fast growing AEC region, unrivalled business opportunities, and high quality MICE professionals and standards. Ongoing initiatives such as the Thailand CONNECT campaign reinforce these unique assets, while offering generous incentives and seamless support to international organisers, the TCEB chief added. This year Thailand is home to a various international exhibitions including Recharge Expo Thailand 2014, ISRMAX Asia Expo 2014, Pharmex Asia 2014, Food & Hotel Thailand 2014, Thailand Lab 2014, BMAM Expo 2014, Green Building and Reprofit Expo Asia 2014, Pulire Asia Pacific 2014, Beyond Beauty ASEAN Bangkok 2014, Gasma Print 2014, Cosmex 2014, In-Cosmetic Asia 2014, ACIEC 2014, EcoLightTech Asia 2014, Sign Asia Expo 2014, CACF 2014, Smart Rail Congress Trade & Expo 2014, Metalex 2014, Motor Expo 2014.